The Bread Loaf School of English is the largest graduate English program in the country. Photo by Todd Balfour. RIPTON, Vt. — Over the next three weeks the Bread Loaf School of English, now in its 93rd summer, is holding commencement ceremonies at each of its four campuses: the Bread Loaf campus in Ripton, Vt.; St. John’s College in Santa Fe, N.M.; University of North Carolina at Asheville; and Lincoln College at the University of Oxford in England. Ninety-three students will receive a Master of Arts degree and three will be awarded a Master of Letters degree in English. On July 25 the Bread Loaf Santa Fe campus conferred five M.A.s, and on July 28 eight students in Asheville will receive their M.A.s. On Aug. 4, 20 students at the Bread Loaf campus at Oxford will receive M.A.s. On Aug. 11, at the commencement ceremony in Vermont, 57 M.A.s and three M.Litt.s will be awarded, and poet John Ashbery will receive an honorary Doctor of Letters degree in absentia. The ceremony at each campus is tailored to the location and to the graduating seniors, many of whom have studied at multiple Bread Loaf campuses. In Santa Fe, for example, the informal ceremony takes place under the expansive New Mexico skies; in Oxford, students graduate in Lincoln College’s 17th-century chapel. At all campuses, the graduates choose an admired faculty member to be the commencement speaker and a member of the faculty or staff to be the hooder, who adds the master’s hood to each graduate’s academic regalia during the ceremony. The senior class president at each campus also speaks and presents the class’s gift to the school. For more information about the Bread Loaf School of English, contact the administrative offices at 802-443-5418 or blse@breadnet.middlebury.edu. 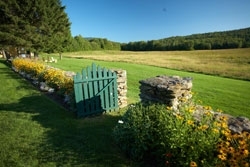 Established in 1920, the Bread Loaf School of English is one of Middlebury’s summer residential graduate programs, offering courses in literature and the allied fields of literacy and pedagogy, creative writing, and theater arts. Students, most K-12 English or language arts teachers, come from across the U.S. and beyond for one or more summers of intensive continuing education. Students may also elect to pursue an M.A. or M.Litt. degree in English. Faculty come from eminent universities in the U.S. and U.K. to teach and learn with this remarkable student body at four distinctive campus sites: in New Mexico, North Carolina, England, and Vermont.